Stretch Tuesday has rolled around again – where does the time go? This week we thought we would share with you some material on the Concave Diamond Pattern which is a carnival glass pattern with a stretch finish. We feel it is the better of two worlds – carnival and stretch glass! 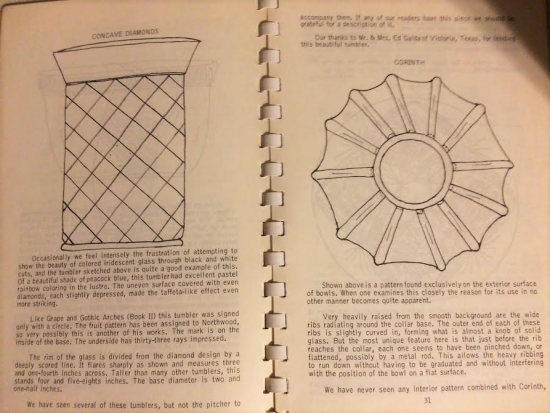 There is actually not much written about Concave Diamonds Pattern by the Northwood Company in Wheeling, West Virginia. Harry Northwood, President and founder of the Northwood Company was a relative of the Fentons, of the Fenton Art Glass Company. Harry worked at a number of glass companies before starting the Northwood Company. His experience at the other companies was reflected in his designs as well as his competitive spirit. Concave Diamonds is a very well-known pattern amongst carnival glass collectors and also amongst stretch glass collectors. The ‘Iridescent Blue’ (a range of blues some a little darker and other blues a little lighter than Fenton’s celeste blue – they really didn’t have quality control like we do today; they made glass to sell!) pitcher and lid are commonly found. 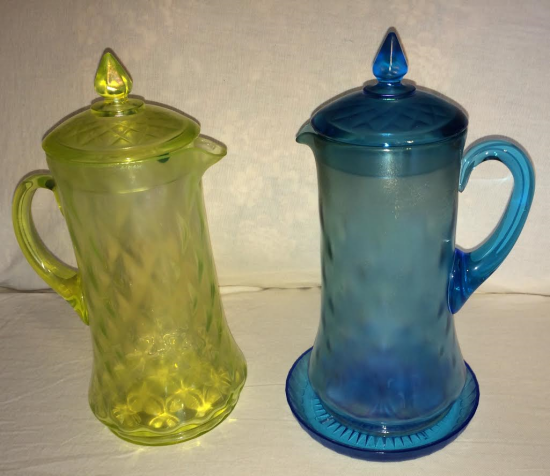 The blue pitcher coaster (non-iridized) is difficult to find. The ‘Topaz Iridescent’ pitcher with lid is very difficult to find. The topaz coaster to fit under the pitcher is also very difficult to find. The same goes for the matching tumblers as well as the coasters that fit under the tumblers. But, did you see the russet (the Northwood Company is the only company to make this color of russet)? If there is a russet tumbler, where is the matching pitcher? If you have one, we’d love to see it and the coaster for the russet tumbler. The bedroom pitchers with small glasses that fit into the top of the bedroom pitchers to keep the flies or other insects out of the water (or whatever beverage is in the pitcher). They are not as easily found, but certainly not in the rare category. They came in the Iridescent Blue, Topaz Iridescent, Russet, and an opaque blue called Jade Blue. As a side note, Frank Fenton said that as a child his mother would put out a bedroom pitcher of water for him every night. Also a famous wealthy San Franciscan said that he had one (not iridescent) by his bed with the glass inside the pitcher. Northwood also made a line of vases in the Concave Diamond pattern. They came out of the molds first; then the glass finisher made the decision of whether to make a vase or a bedroom pitcher. If the decision was a vase then should the top be ruffled, flared out, spittoon shaped, etc. If the piece was to become a bedroom pitcher, then a spout and a handle that was applied (don’t pick up the bedroom pitcher or the lemonade pitchers by their fragile applied handles). Hartung’s Description of Concave Diamond pattern from her Fifth Book page 30 and 31 written in 1964. On the page 31 she is asking if any of her readers have any Concave Diamond pieces besides the “peacock blue tumbler that is shown in the picture”. The Northwood Company went broke (had a tax lien) and the furnaces were turned off December 12, 1925. Going forward into the time machine, back in July of 1973, we along with my parents journeyed back East to visit as many glass companies and friends as well as go to the carnival glass conventions. It was a very busy six weeks. Luckily the old Dodge Polaris was huge compared to our cars today. We lived in California and so our license plates reflected the state that we lived in (had to make a living!). Mom and I couldn’t pass up a factory’s second shop. Near the end of our travels, my mother had nightmares that all four tires would go flat and we couldn’t get home with all of our glass! But back to Wheeling, West Virginia, we found the vacant lot where the Northwood factory was located. Even though it was raining, we got out of the car to look for shards of glass. It was break time for the bakery workers next door; they had more fun watching us from the porch of the bakery. We kept hearing the murmuring ‘of those crazy Californians’! Some of the shards that we found at the Northwood factory site in 1973. 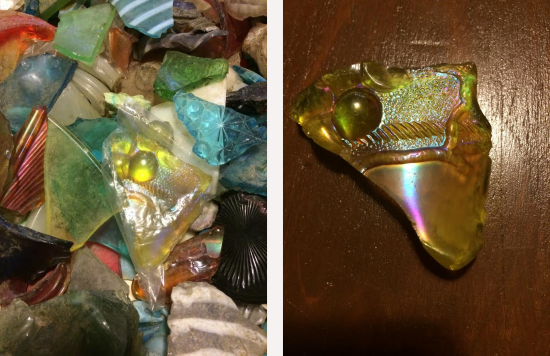 Notice the topaz Northwood Grape and Cable shard in the middle (and in the second picture) and the stretch topaz Iridescent piece next to it. Would love to see the piece of glass that Grape and Cable shard was from.